Beakers Euro Design are moulded in Polypropylene, have excellent clarity and very good chemical resistance. These autoclavable beakers euro design have prominently raised graduations on the outer surface. 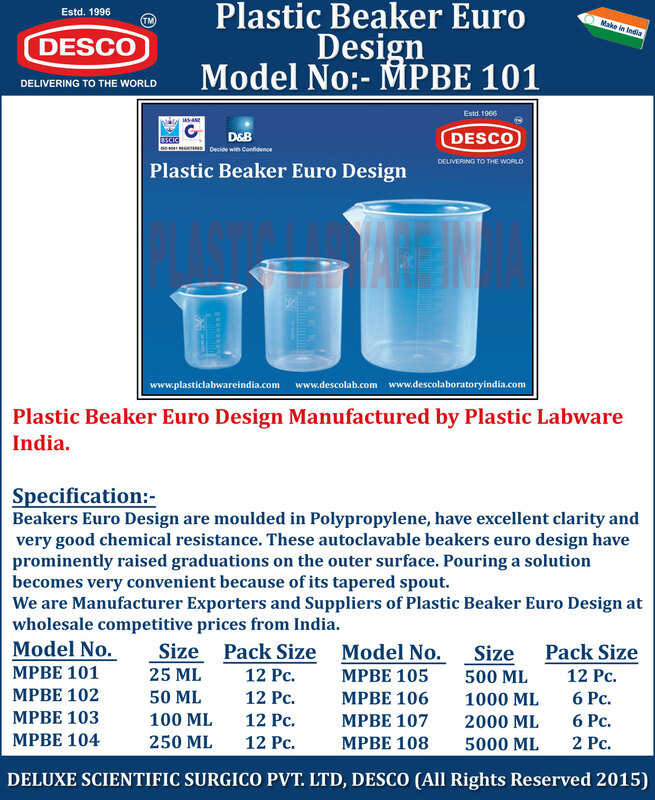 We are Manufacturer Exporters and Suppliers of Plastic Beaker Euro Design at wholesale competitive prices from India. MPBE 101 25 ML 12 Pc. MPBE 102 50 ML 12 Pc. MPBE 103 100 ML 12 Pc. MPBE 104 250 ML 12 Pc. MPBE 105 500 ML 12 Pc. MPBE 106 1000 ML 6 Pc. MPBE 107 2000 ML 6 Pc. MPBE 108 5000 ML 2 Pc.